Vélib’, the bike share system of Paris, will display this message at all of its 1,800 stations today. 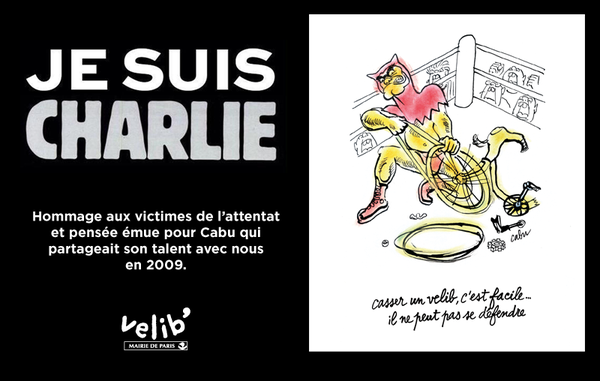 My French is terrible, but the caption for the cartoon on the right translates to, “Breaking a Vélib’ is easy…he can not defend himself.” The cartoon is by Jean Cabut, known by his pen-name of Cabu, who was one of the victims in yesterday’s attack on Charlie Hebdo. Thanks for this link. So very interesting! I really appreciate it.